Let it be said, I am not a fan of broccoli. It has a weird smell to me that I don’t really love. But, if you mix it with other things, like cheese, it becomes all the more flavorful! Chicken & broccoli is a common combination that can be quite appetizing. 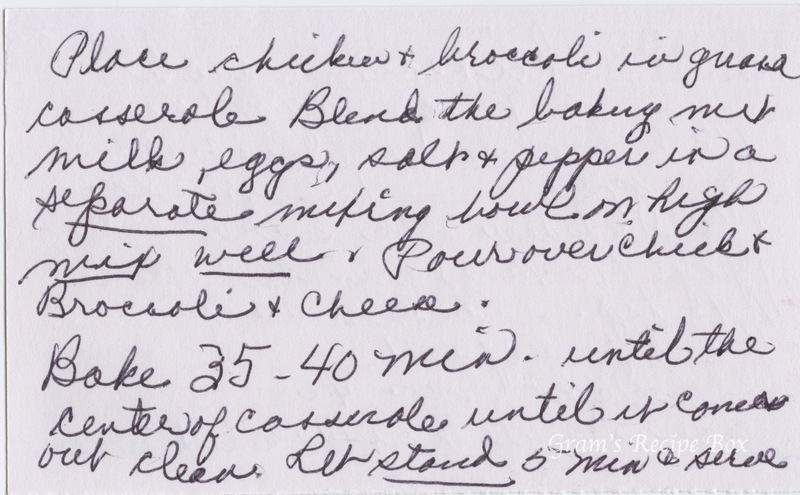 The “Jiffy mix” referenced in the recipe is a brand of baking mix similar to Bisquick or other prepared baking mixes. You can find the corn bread muffin mix at many grocery stores. The parent company, Chelsea Milling Company, was established in 1901 as a flour mill. According to their website, the Jiffy mix concept became popular in the 1930s, and has remained a market leader since that time. Not only do they have boxed mixes for consumers, restaurants are also able to purchase their mixes for commercial food service. They are located in Michigan. Preheat oven to 400. Grease 2 quart casserole dish. 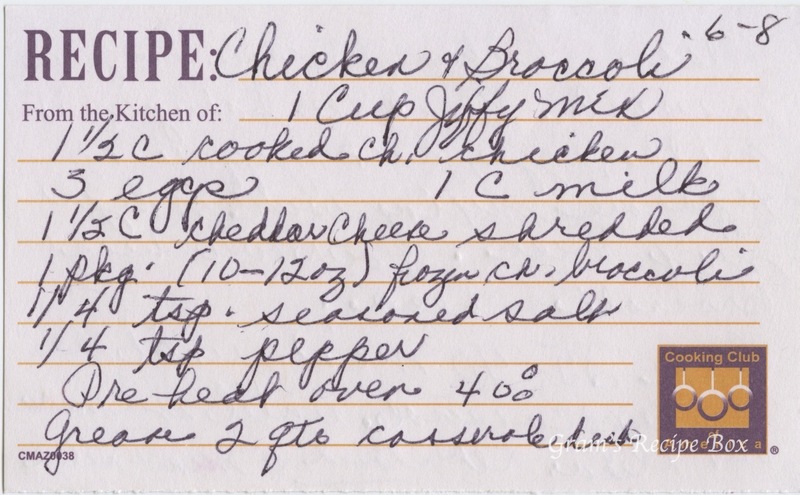 Place chicken & broccoli in greased casserole. Blend the baking mix, milk, eggs, salt & pepper in a separate mixing bowl on high. Mix well. Pour over chicken & broccoli & cheese. Bake 35-40 minutes until the center of casserole until it comes out clean. Let stand 5 minutes & serve.